Motorcycles come in different segments, sizes, and classes. India is one of the biggest bike markets in the world. Few of the top bike manufacturers are from India. While the Indian market primarily favors the entry-level commuter segment motorcycles, the market for the sports bike in India and mid-weight bikes or 600cc bikes in India are growing with each passing month. Best bikes in India. There are a number of two-wheeler companies in India. Many of them are indigenous while many are from the foreign countries. While Indian market is expanding at a good rate, new manufacturers from international markets are also setting up base in India. With all the new and old manufacturers, the Indian market has become a lot diverse than it used to be a decade back. Customers in the market are also maturing, and as many bike enthusiasts are becoming financially strong, they are looking to upgrade their rides. The '600cc segment' or as popularly known as “mid-weight” segment is one of the most practical segments in the world of motorcycles. The mid-weight segment bikes have the optimum power that can be used on streets and the track. It is also the ideal upgrade for any biker who is graduating from lower displacement bikes. Here are top 10 mid-weight motorcycles available in India and the world. The Hyosung Aquila 650 is the only cruiser in the segment. The motorcycle comes with an elongated tank with faux air intakes. Hyosung has used a generous amount of chrome over the body of the motorcycle. The Aquila Pro looks premium with all the detailing. It is powered by the same engine that powers the Hyosung GT650R. The 647cc, liquid-cooled V-Twin engine generates a maximum power of 74 Bhp at 9,000 rpm and the torque peaks at 62 Nm at 7,500 rpm. It uses a 5-speed gearbox, and the gears are tuned to give a stress-free ride over a long distance. The engine becomes loud and harsh when it is revved till the red line. It is best for open highways where the rider plans to ride at the constant speed. 600cc cruiser bike. The Hyosung GT650R is one the most affordable bikes in the segment. The fully faired motorcycle. It does not look great, but it is a fully-faired bike that turns a lot of heads on the road. The GT650R gets horizontally stacked headlamps which are uniquely shaped. The visor is curvy and provides wind protection even at good speeds. The Hyosung GT650R is powered by 647cc, the liquid-cooled V-Twin engine that generates a maximum power of 72.6 Bhp at 9,000 rpm and 60.8 Nm of peak torque at 7,500 rpm. Hyosung has made a few ECU changes for the Indian market which makes the motorcycle easier to ride in the traffic situations. The motorcycle is based on a rigid frame with rectangular section swingarm. It is quite stable on the straight line but loses composure on the curves. The Hyosung GT650R is also quite heavy and does not like to change direction quickly. In true words, it is an affordable bike to buy which makes it quite popular but is not up to the Japanese quality mark.This is one the best 650cc bikes in India in this list. Kawasaki introduced the middleweight long distance touring machine, the Versys 650 in the Indian market. The Versys 650 looks very similar to the Versys 1000, the flagship in the Versys range. The fairing incorporates the slender headlamps and above it the adjustable windshield. The Versys gets deep creases on the body, making it look like a proper liter class motorcycle. The contoured fuel tank sits nicely with the overall design. It gets LED tail lamp and a short exhaust. The Versys 650 comes with a 649cc parallel twin, liquid-cooled engine with fuel injection. The engine produces a maximum power of 67.5 Bhp at 8,500 rpm and the torque peaks at 7,000 rpm. The same engine powers the Ninja 650 too but the power has been retuned to fit Versys’ touring character. It is one the best long distance touring machines in the segment and comes in black and green color. If you are looking for a naked sports bike in the mid-weight segment, the Kawasaki Z650 is the answer. The hyper-aggressive looking Z650 get sharply designed headlamp unit with integrated DRLs. There is a small windscreen above the headlamp which also holds the number plate. The Z650 gets a compact instrument panel with a big tachometer and a big gear position indicator. Apart from that, there are other indicators and meters. There’s a muscular fuel tank with ignition mounted on it. The tank can hold up to 15.14 liters of fuel. The Z650 gets split seats and an X-shaped LED tail lamp. The suspension is asymmetrically mounted on the gull-arm swingarm. The motorcycle continues to get the underbelly exhaust unit which is centrally located. The Z650 is powered by an inline-two cylinder 649cc liquid-cooled engine. It generates a maximum power of 67 Bhp at 8,000 rpm and 65.7 Nm of peak torque at 6,500 rpm. The engine gets a 6-speed transmission and slipper clutch. The motorcycle gets 300 mm petal disc set-up at the front and 220mm single-disc set-up at the rear. This is one of Kawasaki 600cc bikes in India. 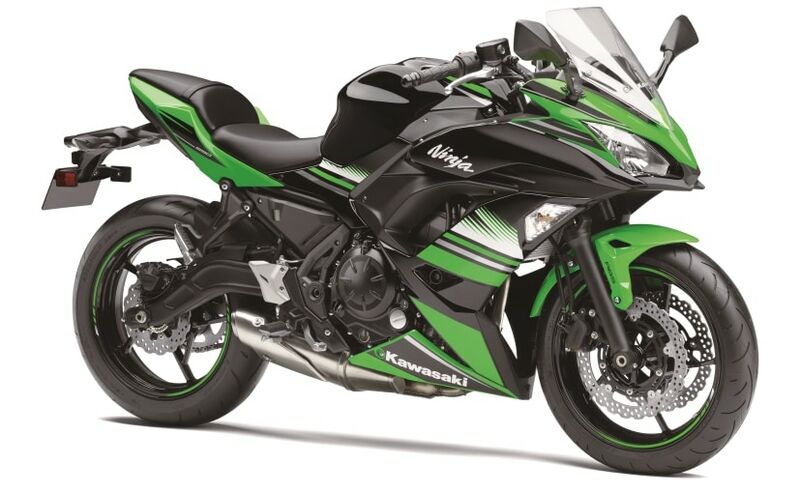 Kawasaki has updated the Ninja 650, and it truly looks like a full-size 600cc segment sports bike now. The motorcycle is a sports tourer and competes against the Honda CBR650F, but in real life, it looks much more aggressive and yet comfortable to ride. The motorcycle gets angular headlamps with twin set-up. There is an adjustable windscreen too. The console is part digital and part analog for easy readouts. Kawasaki has put in every effort to make the Ninja 650 look like a sports bike. The motorcycle gets single-piece handlebar, but it has been designed as clip-on. The seating posture remains as comfortable for long distance riding. The motorcycle is powered by 649cc, parallel twin, liquid-cooled engine that is tuned to deliver 67 Bhp at 8,000 rpm and 65.7 Nm at 6,500 rpm. The engine gets mated to a new assisted slipper clutch for aggressive downshifts. The motorcycle gets dual 300mm petal disc set-up at the front and 220mm single disc set-up at the rear. The middleweight touring machine gets standard ABS. The Benelli 600 GT is the touring version of the 600i. The motorcycle is purpose built for long distance touring and comes with many types of equipment to support it. There is a small windshield to stop the windblast. The motorcycle gets projector headlamp and high capacity fuel tank of 27-litres. The handlebar is flat and wide while the broad seat offers an upright seating posture. The 600 GT looks little blunt, but it has all the practical things needed for long distance touring. The engine remains same as the 600i. It is an inline four cylinder 600cc, liquid cooled engine that produces a maximum power of 83,9 Bhp at 11,500 rpm while the torque peaks at 54.6 Nm at over 10,000 rpm. The 6-speed transmission also remains the same. The Benelli 600 GT gets 320mm disc brake at the front with four-piston radial calipers and a single 260mm disc at the rear with a single caliper. The motorcycle does not get ABS, even as an option. The Italian bike maker has been gaining much popularity in India due to the affordable price tag it comes with. Benelli motorcycles are also high on performance and look unique in the segment. The Benelli 600i is a naked mid-weight bike. It gets a sculpted tank with angular tank extensions. The motorcycle is based on tubular trellis frame and gets a under seat four-into-two exhaust system that makes it look incredible. The Benelli 600i looks beautiful and attracts a lot of attention on the road. The motorcycle is powered by 600cc, inline four cylinders, liquid cooled engine. The engine generates a maximum power of 83.9 Bhp at a high rev range of 11,500 rpm while the torque tops at 54.6 Nm at 10,000 rpm. The motorcycle is mated to a six-speed gearbox. The motorcycle weighs 231 kg, which feels heavy when standstill but once it starts moving, the motorcycle feels very clickable. The low-centre of gravity and upright riding position makes it a fun bike to ride through city traffic, and it can be taken on occasional highway cruising too. Honda CBR 650F is a sports tourer. It became Honda’s first ever mid-weight motorcycle in the Indian market. The Honda 650cc sports bikes in India sports bike gets strong character lines and resemblance to the Honda’s sports tourer flagship, the VFR1200. The motorcycle gets a single headlamp set-up while the tank gets strong creases. The 650cc motorcycle gets a single piece seat, but that does not reduce its masculine nature. The CBR650F is a sport touring motorcycle, and the handlebar is designed in such a way that the rider sits in a comfortable position that can be held for long rides. The motorcycle comes powered by an in-line, four-cylinder, liquid-cooled engine. The 648.72cc engine produces a maximum power of 85.3 Bhp at 11,000 rpm and 62.76 Nm of peak torque at 8,000 rpm. The motorcycle weighs 215 kg. Honda CBR650F comes with a 6-speed transmission. The front gets telescopic forks while the rear gets a mono-shock suspension. 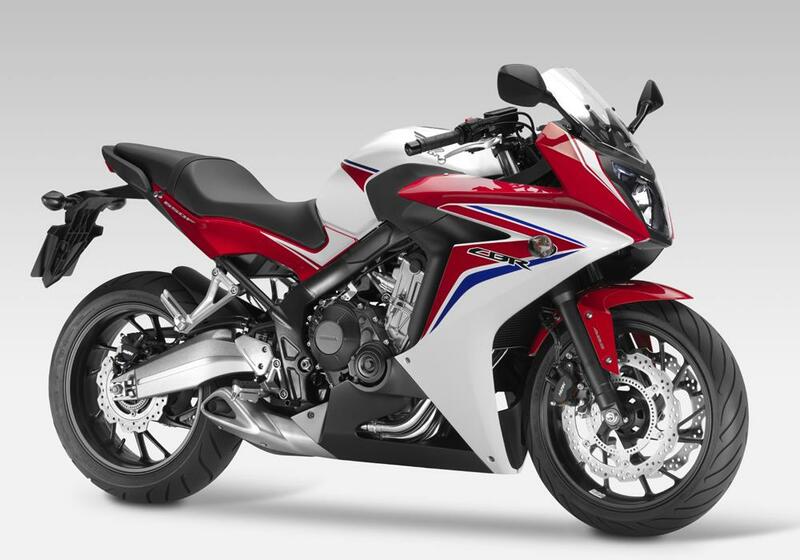 The CBR650F gets 17-inch wheels with disc brakes at both front and rear. The front gets 320mm single disc set-up while the rear gets 240mm single-disc setup with ABS. It can do 0-100 km/h in just 4.23 seconds and can go beyond the 200 km/h mark. The Daytona is the mid-weight 600cc sports bike offered by the British manufacturer, Triumph. The Daytona 675 looks sharp but it does not look as futuristic as the Japanese models, but it sure has a charm of its own. The Daytona has a twin-headlamp set-up with an aggressive fairing on the body. The motorcycle gets edgy tank design and a very flamboyant rear section. 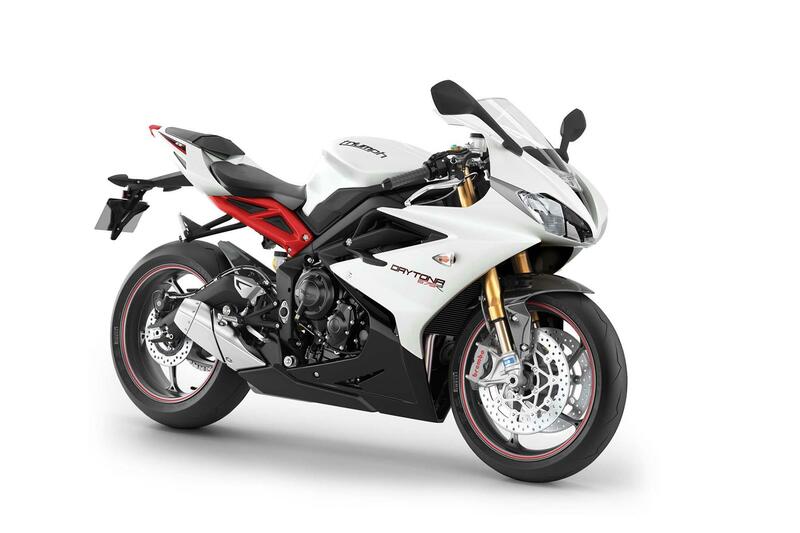 The Daytona 675 gets partially exposed frame which is painted in contrasting color to the body. There are split seats and a very regular looking exhaust, but it has been designed by Arrow. The Daytona is unique in the segment because of its three-cylinder engine layout. The 675cc engine is liquid-cooled and gets titanium valves. The engine produces a maximum power of 126 Bhp. The R version of the Daytona loses out on extra weight because of the carbon fiber parts it gets. The motorcycle can hit 0-100 km/h in just 3.5 seconds and can hit a top speed of 250 km/h. The Daytona 675R comes with a quick shifter and a slipper clutch that makes the shift super quick. The motorcycle comes with 17-inch tires and 4-piston Brembo Monobloc brakes at the front. There is twin disc brake set-up at front and single at the rear. The ABS is offered as standard. Triumph launched the 2017 Street Triple S in India recently. The unique twin headlamp motorcycle now gets LED position lamps. The body gets sharp lines which make it look very aggressive. The 2017 Street Triple S gets shorter exhaust muffler and new twin-seat. The instrument panel gets a large analog rev counter and a small digital readout. The LCD shows details like gear position, selected riding mode, fuel gauge, odometer, trip meter and fuel consumption. The motorcycle also gets a new electronics package, with new traction control, ride-by-wire and two riding modes - Road and Rain. 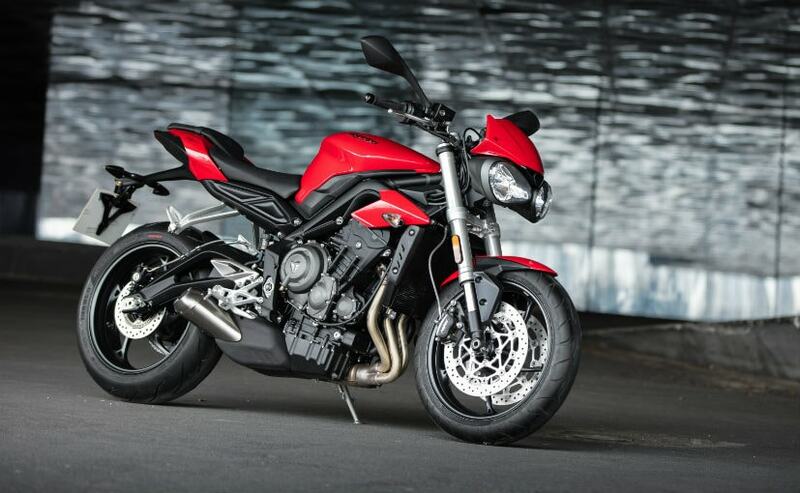 Triumph has increased the engine size in the new Street Triple. It is now 765cc instead of the 675cc in the previous generation model. The motorcycle now makes 111 Bhp of power at 11,250 rpm and the torque peaks at 73 Nm at 10421 rpm. The power has increased by 40 percent while there has been an increase of 30 percent in torque. It is one of best "600cc bikes in India". These are the Top 10 Best 600cc Bikes in India 2018, If you like this article then keep like and share.